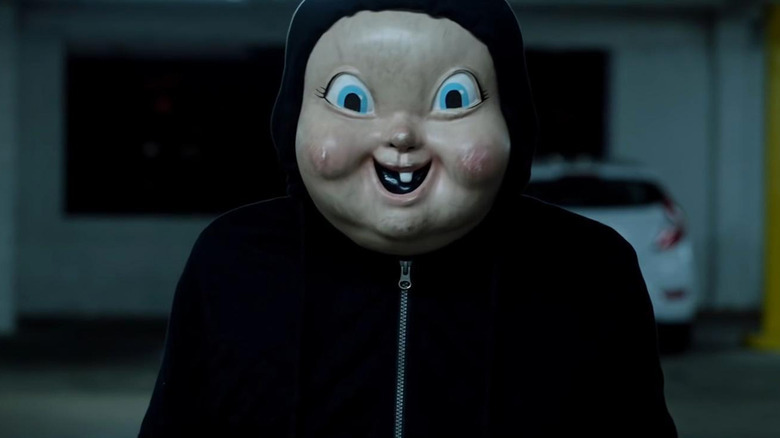 Happy Death Day ended up being a delightful surprise when it hit theaters—shooting to the top of the box office charts, reaping a domestic gross of $55 million off a $4.8 million budget, and earning enthusiastic reviews from critics and audiences alike. That's quite an accomplishment for a film that can be described as Groundhog's Day meets Scream. On the surface, the story follows a college girl who's forced to relive the same day over and over while attempting to not be murdered in the process. 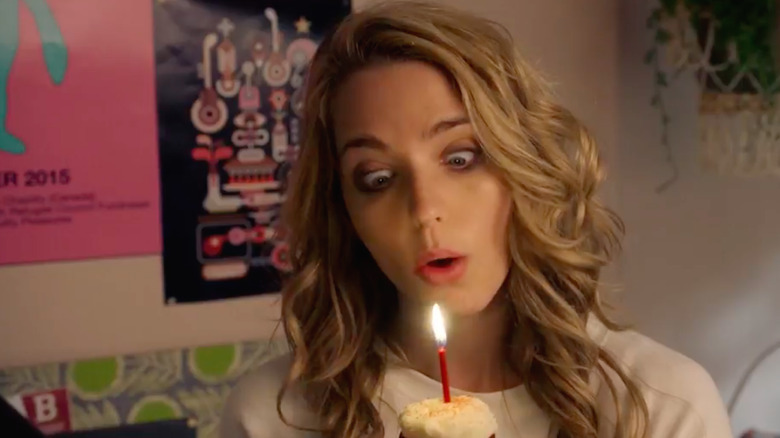 But while the movie provides a fun mix of intrigue, genre humor, and jump scares, Happy Death Day unexpectedly explores some deep issues as well. This isn't just a movie about a girl named Tree (Jessica Rothe) who's stuck in a murderous time loop. Let's take a step back and break it all down. Warning: there are major spoilers ahead. There are two main plot devices that drive the Happy Death Day story: the mysterious identity of Tree's killer and the cause of that unfortunate time loop. While the movie does end up revealing Tree's killer in the end, audiences never receive a real explanation for the loop our hero gets stuck in. What the movie does do, though, is give us pieces to a bigger puzzle—leaving viewers to fill in the blanks on their own. In an interview with Thrillist, director Christopher Landon (Paranormal Activity: The Marked Ones) admitted that, during pre-production, Universal insisted on a clearcut reason for the time loop. But Landon stuck to his guns, maintaining that the mystery behind Tree's predicament—her murder, the time loop, her mother's death, her fractured relationship with her father, and the growing list of murder suspects—would keep viewers invested until the film's final moments. "For me," he explained, "it was about making sure there were enough credible red herrings and suspects." Added screenwriter Scott Lobdell, "I wanted to take the horror movie and slasher movie tropes and turn them upside down." While it was a definite risk to flip this formula on its head, the end result proved to be a sleeper hit that kept audiences talking long after the end credits rolled. In the beginning of the story, Tree's depicted as the stereotypical sorority girl—you know, the tired cliché that's been explored in movies like Mean Girls and TV shows like Scream Queens. She's mean to damn near everyone, and her materialistic, self-serving behavior is continually rewarded by Danielle (Rachel Matthews), the leader of the sorority in question. But while audiences are immediately inclined to hate Tree, her journey quickly turns the tables on viewers, as the movie plants some mysterious (even supernatural) seeds for this murder mystery to unfold. In the process, comic book writer Scott Lobdell's story offers up some complex character layers, making Happy Death Day's unconventional lead worth empathizing with. It's a simple concept, and one of the story components that helped the horror film defeat Blade Runner 2049 at the box office. "Every slasher film opens up with the mean girl getting killed and the good girl living till the end," Lobdell told Thrillist. "And I thought, How can I make the mean girl and the good girl the same person?" One popular time loop theory involves Tree's own deceased mother. The day our hero relives is not only the one that she is murdered on—it's also her birthday … which is also her deceased mother's birthday. Each morning, Tree finds herself waking up in the dorm room of a somewhat bookish college kid named Carter (Israel Broussard). As she lives out this repetitive nightmare, Tree continually leaves a bracelet her mother gave her behind, prompting Carter to return it time and again. Forgetting such an important item is just one sign of Tree's denial. She's living in a party-filled rut which helps her drown out the emotional and physical strains of facing the grief of her mother's death head on. The movie has some fleeting moments when Tree watches old birthday videos—reflecting on some happier memories with her mom. But each and every day, she continues to ignore her father's phone calls, which alludes to a fractured family dynamic that not only manifests itself in Tree's constant partying, but in her awful personality as well. Is it possible this murderous time loop was orchestrated by her own beyond-the-grave mother? The supernatural concept is quite silly, when you think about it, but the clues definitely line up. 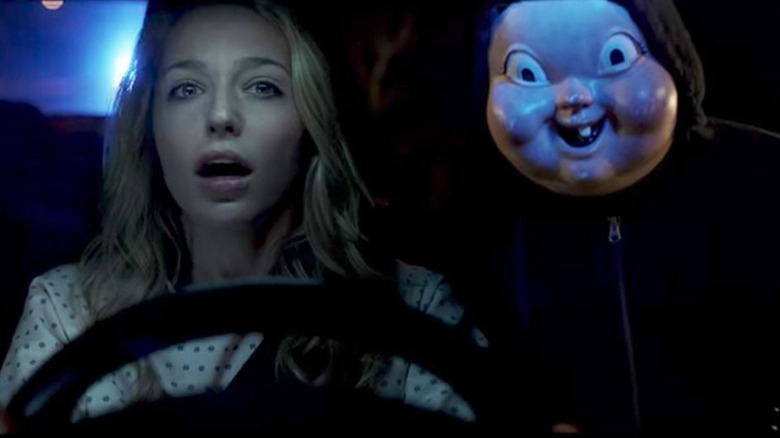 On the surface, Happy Death Day is a murder mystery that keeps the audience guessing until the end. But deep down, the movie is an exploration of grief—and the emotional and physical toll it can take on a person. We've already discussed the death of Tree's mother and her fractured relationship with her dad. And while the time loop she finds herself in physically traps her in a nightmarish world where she has to repeat the same day over again—the anniversary of her birth, which once again ties her existence back to her mother, with whom she shared a birthday—the movie alludes to Tree's life already being stuck in a repetitive cycle of heavy partying and destructive behavior. Basically, she's leading a lifestyle that drowns out reality and the adult responsibility that comes with it. It takes this time loop to open her eyes to the destructive path she's already on. There's a moment in the movie when Tree acknowledges in a throwaway line that her father wouldn't like the person she's become. It's a weak justification for ignoring his phone calls. But as the hunt for her killer hits its stride, and Tree finds herself in the hospital, she receives x-ray results that point to extreme damage on her internal organs. With each death—and subsequent rebirth—she carries the scar tissue with her. It's a sign that, no matter how much she fights to keep her trauma buried, the damage will surface one way or another. While it's not lost on us that a killer dressed as a baby is out to murder our hero on her birthday, it's not long before Happy Death Day's number one suspect is revealed: serial killer Joseph Tombs (Rob Mello). As Tree finally confides in Carter, telling the boy about her mother's death and the broken relationship with her dad, a news story announces Tombs' admittance to the hospital conveniently located on her college campus. This detail not only injects some welcome hope into Tree, it gives the story's murder mystery a firm directive towards redemption and closure. Tree pieces together a plan to confront Tombs at the hospital—during the blackout that happens each night—opting to kill him and break the time loop once and for all. As you may expect, things don't go according to plan. Instead of taking out Tombs, Carter rushes in to help Tree and is murdered by the killer in the process. This leaves our hero in an unfortunate pickle: if she kills Tombs, her time loop will close leaving Carter permanently dead, so she climbs to the top of a clocktower and hangs herself. In the end, it's revealed Tombs isn't even the killer she's been hunting. But this scene showcases Tree's personal growth: she selflessly kills herself, saving Carter's life in the process. Basically, Tree finally put someone else's well-being before her own. At the beginning of Happy Death Day, Tree is horrified, hung over, and confused to find herself in Carter's dorm room. He's nothing but a gentleman and the chemistry was obviously there, but Tree opts to pursue a romantic relationship with her married professor Gregory (Charles Aitken) instead. Through her own unresolved pain, she seeks solace in an older man who is technically unavailable—giving her the power as her teacher's marriage hangs in the balance. As the story evolves, it becomes clear that, of all the men in Tree's life, Carter is the only one she can really trust. Once she confides in him, Carter believes her time loop theory and gives her a simple relationship baseline she's been missing since her mother's death. Human connection comes with communication and, through Carter's emotional and physical support, Tree begins opening her eyes to the world around her and the destructive lifestyle she's been living. A superficial barrier between sorority party girl and nerdy college kid is thusly broken, giving Tree motivation to finally face her father. To say that Happy Death Day follows an unexpected redemption arc would be an understatement. It's a final girl-style horror movie tale of a bad girl who makes good. Through dying over and over, Tree rediscovers an appreciation of life—which results in a delightful romance with Carter and the inevitable reconnection with her estranged father. Tree's murderer was right under her nose the whole time. Instead of a grizzled serial killer or stalker ex, her jealous roommate Lori (Ruby Modine) was the culprit. Sometimes a crime of passion isn't the big mystery you think—sometimes, a murder can be committed for uncomplicated, dumb reasons. From the very beginning, Tree was given a birthday cupcake as a gift. And each time, our hero never ate it—until the moment, that is, when she and Carter came together to celebrate the death of serial killer Jeffrey Tombs. After all, his demise meant the time loop was broken. They shared a bite—and Tree died again. In Tree's final face-off with Lori, it came to light that her nurse roommate set up Tombs to take the fall for Tree's murder, all because a guy Lori liked had the hots for Tree instead. This whole reveal may feel like a bit of a letdown, but the real meat of Happy Death Day doesn't exist in Tree's mission to find her murderer—it's really in her own internal struggles. On that front, Tree had already found her redemption, and when you view it from that perspective, Lori being the killer works rather well. Tree kicking her roommate from the window offered the physical action that coincided with her own emotional journey's climax. She literally kicked out her superficial past, moving forward in pursuit of a normal, happy existence. As it turns out, the movie's original ending wasn't as cut-and-dry. When an early cut of Happy Death Day was screened for audiences, the film's climax was met with a bunch of angry viewers. According to Landon, the movie was set to end with Tree being murdered yet again, alluding to the time loop never being stopped. Needless to say, audiences weren't into it. "They were so pissed off because they felt betrayed," the director explained to CinemaBlend. "They were like, 'Wait, she did all this hard work, and made all these changes and she's a better person now. And then you kill her again?' And so because I still wanted the satisfaction of making people think, 'Oh god, it's never going to end' … that's how I came up with the ending that's in the movie now." Not only does the theatrical cut of the film work, its ending leaves the story open for a sequel. "I do have a sequel ready in my head, and it's definitely not what anyone is expecting, but it will make a lot of sense," Landon hinted to The Hollywood Reporter. "And it will answer a lot of questions that may pop up in the first movie for people." That being said, the alternate ending will be included among the special features of Happy Death Day's home entertainment release, which arrives in stores on January 16, 2018.